In 2017, Bulgaria’s GDP grew by close to 4%, similarly to the previous year. The pattern of growth switched from being export led in 2016 to being driven by domestic demand in 2017. Manufacturing, tourism and business services remained the main growth drivers. The rise in labour demand led to a labour shortage, which is turning into a constraint on growth. 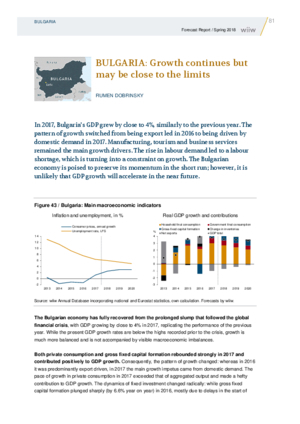 The Bulgarian economy is poised to preserve its momentum in the short run; however, it is unlikely that GDP growth will accelerate in the near future.